Many financial transactions and/or property sales are conditional based on the findings of a Phase II Environmental Site Assessment. Subsurface soil and groundwater investigations are mandatory requirements of Phase II Environmental Assessments, and are conducted to determine whether or not contaminants are present at a specific site. Subsurface soil and groundwater investigations may also be performed to define the extent of subsurface contamination during a cleanup or remediation project, for example, delineating an underground oil or diesel plume resulting from a spill, or for analyzing for contaminant concentrations to determine whether remediation is even necessary. The Ministry of the Environment and Climate Change (MOECC) provides guidance and procedures on soil and groundwater sample handling and analytical methods for sites in Ontario. Subsurface soil and groundwater investigation determines specific soil composition at specific depths and water table depths for sampling and monitoring purposes. The data collected is vital in determining whether or not remediation is necessary, to what extent the material is impacted and, if needed, to be able to apply the best remedial method for the existing conditions. Split-spoon sampling and soil core sampling are methods used to collect soil samples. Split-spoons are stainless steel sampling tubes that are driven into the ground through a borehole that has been prepared by a drill rig equipped with a hollow stem auger. Soil core sampling is done with a direct push system that drives a stainless steel device loaded with a plastic liner into the subsurface soils. Groundwater samples are collected through monitoring wells installed using a drill rig equipped with a hollow stem auger. Monitoring wells must be properly developed and registered in compliance with the Ontario Water Resources Act. When the monitoring wells are no longer in use, they must be decommissioned as required by regulation. Both methods provide continuous and/or discreet interval soil samples that are undisturbed. Comco Canada Inc. owns and operates all the required equipment for augering, installing monitoring wells, and engaging in split spoon or direct push soil core sampling. Owning the proper equpment allows Comco to carry out accurate sampling at a variety of sites under varying site conditions at lower cost and greater coverage. Comco is registered with the Ministry of the Environment and Climate Control (MOECC) as a licensed well contractor. 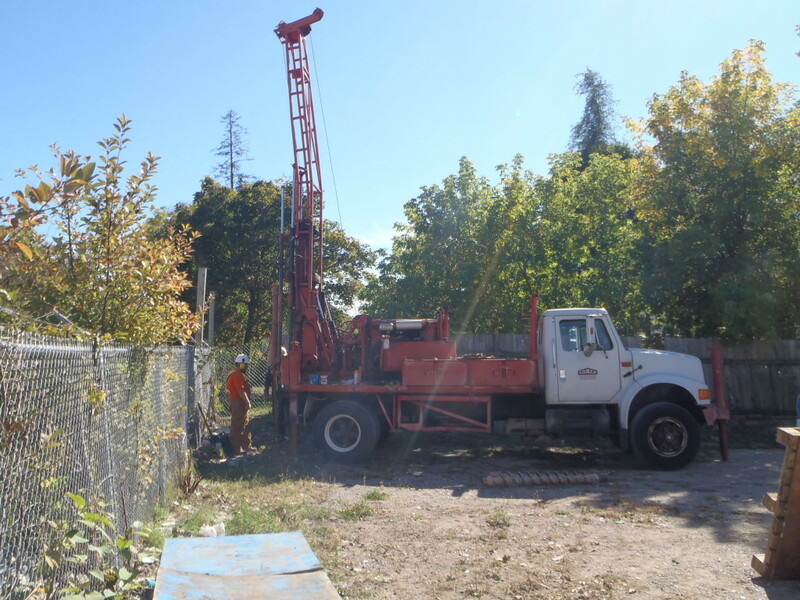 Our team of knowledgeable certified Well Technicians have successfully drilled boreholes collected soil and groundwater samples and installed and decommissioned monitoring wells at numberous sites throughout the Ontario. Comco Canada Inc. has more than 50 years of experience and has developed an excellent reputation for delivering quality work at reasonable cost to our clients.